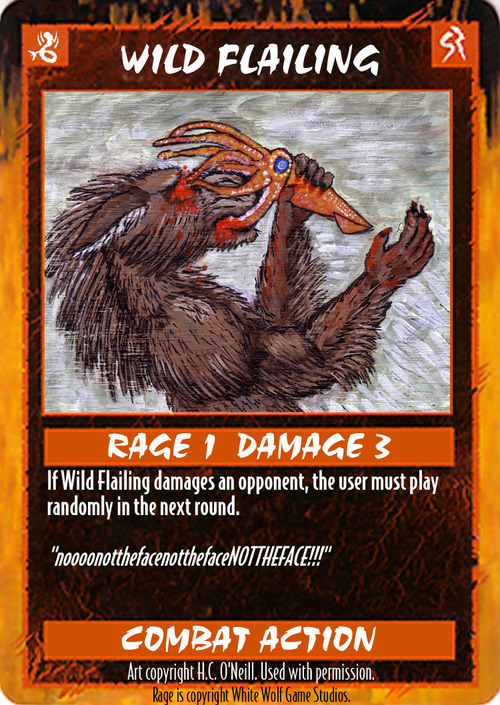 As Werewolf: The Apocalypse celebrates its 20th anniversary, fans of its spinoff collectible card game, Rage, are still producing free print and play sets featuring art from many awesome furry artists. Call of the Sea brings the battle for the ocean to the Rage CCG. It kicks off with the Chulorviah deck, featuring mind-controlling parasitic cephalopods. The block includes three semi-constructed decks and a combat set. The combat deck and Chulorviah deck are available for download, or you can get the Rage plugin for Lackey and play online. The Rokea (sharks) and Sea Dogs (werewolf pirates) decks will be released later this year. This is a perfect jumping-off point if you’re new to Rage. Download and print the deck, and with a few minor tweaks to construction, you’re ready to go – or dust off your old Rage collection and use it with the original cards. They are fully compatible. All cards are extensively playtested and comply with White Wolf's fan-work policies. The sets are free to download and print. Cards are fully illustrated and the art appears in Call of the Sea with the written agreement of each artist. 70% of Gaia is covered with water. The Chulorviah have spread like a plague through those waters, part disease, part spiritual taint, that warps the flesh of those exposed to it. No one knows how it truly spreads or how to defend against it. Ira Martin: Hide and Seek. Christiee Anne Hochstine (SqueakyChewToy): Thrashing Limbs. Everett Hebert: Dennis Cowner and Seize the Reins. Roz Gibson: CEO on Vacation and Superior Reach. Becca Jones: Forgetfulness and Rally to Battle. Koula: Anatomy Lesson and Vicious Assault. Bastiaan Rours: Scylla, Oorl, Arms of the Abyss, Enfolded, Bloodlust (collaboration with Filip Cerovecki). Filip Cerovecki: Deepwater Complex, GENES and Bloodlust (collaboration with Bastiaan Rours). Amanda ‘Laughing Hyena’ Johnson: Call of the Depths, Circle of Death, Bar the Way, Dismember and Mitey Bitey. Wes Jones: The World in Our Image, Drag Beneath and Iron Skin. 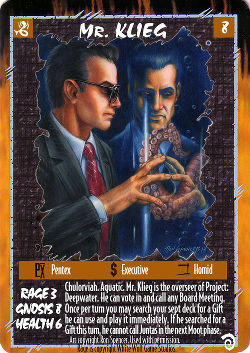 Ron Spencer: provided art for Mr. Klieg as result of Pierre-Jean Cottalorda’s pledge on the Werewolf 20th Kickstarter.